When L, K & I went for dinner and drinks at Roc in Tribeca two nights ago, we thought we knew exactly what our main topic of conversation was going to be. L had just been through a bad experience with a guy and was in need of girl support so we were going to be indulging in one of my favourite past-times of late (I'm sure it's just a phase! ): man-bashing. Which is precisely what we did, fueled by the flowing wine that kept being poured into our glasses by the attentive waiter, while enjoying probably one of the last balmy evenings of the year sitting in the outdoor terrace ... that is until the sun started to set and we noticed two tall blue lights emerging from between buildings, where the World Trade Center would have been. And our conversation took an entirely different turn. 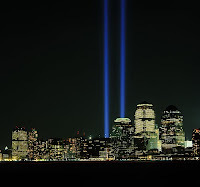 I remember watching a documentary on 9/11 around six months after I moved here. I was catching up on emails late one night with the TV tuned into the Natural Geographic channel in the background. The documentary came on, and while I would have normally opted not to watch it, I found myself not only engrossed by it but also crying uncontrollably. Like everyone else I remember that day and the shock I felt. But I found myself overcome with new grief and sadness that night. My office at work overlooks Ground Zero so I was surprised by my strong reaction as I am essentially reminded every single day of what happened. But when you live in Manhattan you come to appreciate that, despite the skyscrapers and the wide avenues, it is really just a tiny strip of land and I truly realized for the first time the scale and enormity of what happened to New Yorkers that day. Both L and K were working in the World Financial Center and hearing their first hand experience of the events of that day was heartbreaking. The panic of the evacuation, the dust they were covered in, being unable to reach their families, seeing people jumping out of the blazing towers (a sight they both still have nightmares about) - these are accounts I had heard on TV but hearing it from two of my best friends made it terrifyingly real. They explained that the terrace we were sitting on right now would have been covered with flyers about missing persons. They told me of the emptiness of the City for the first couple of weeks following the tragedy with no taxis, no public transport, no-one in the streets. A ghost town. A city striken by grief. Boy troubles obviously paled in comparison. There are much more important things to be concerned about as well as things to be truly thankful for, and our evening, however emotionally intense, helped put everything in perspective.